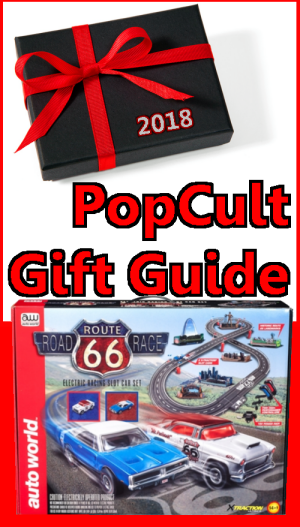 Our final BIG TICKET DAY pick for The 2018 PopCult Gift Guide this weekend goes back to one of my favorite toys of my childhood, electric Slot Car sets. The Auto World 10′ Route 66 Slot Race Set is the latest racing set made by the folks Auto World, using the traditional HO Scale, Aurora-style X-Traction Ultra G-Slot Cars. Race back in time to the glory days of America’s Mother Road – Route 66! You control the action as you race the supercharged ’55 Bel Air and ’69 Charger X-Traction Ultra-G slot cars across the Midwest from Chicago to Santa Monica, CA. Speed past the St. Louis Arch, the Golden Oil Driller, Cadillac Ranch and more famous Route 66 landmarks! A great action packed gift! Auto World brings back some history and maybe some memories of a trip down historic Route 66. 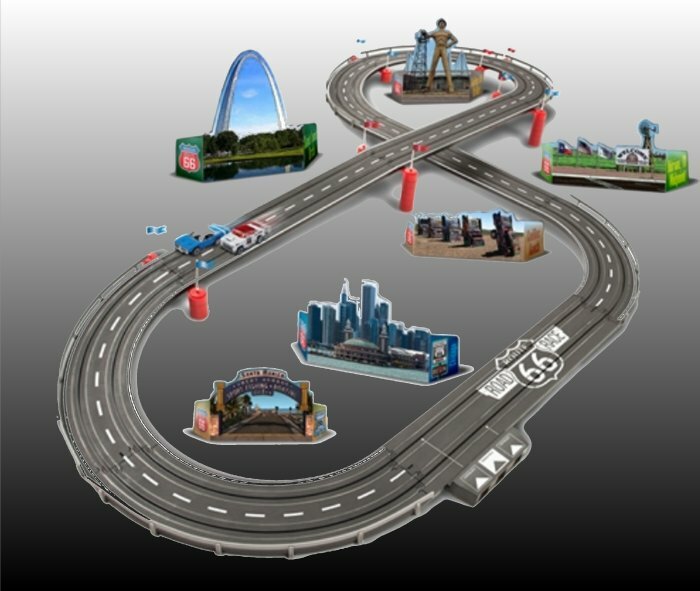 Highlighted landmarks surround the 10 ft. of slot car track. Race the Route or just go for a Saturday cruise. Includes 55 Chevy and 69 Charger cars. Fold-up scenic items. 10′ of track. 2 controllers and power-pack. Cruise Route 66 in the comfort of your own home in classic cars and without paying a penny for gas. I had slot cars as a kid, and in addition to providing hours and hours of fun, they also taught me a lot about electrical wiring and how to drive like a maniac. The is a great set for the automobile fanatic on your shopping list, regardless of their age. You can buy it for just under $110 with free shipping directly from Auto World, or shop around to see if you can find a better deal.